Four arrested after €1,274 theft from the World of Disney store. Four men were arrested on Monday 16 January 2018 after they stole goods to the value of € 1,274 from Disneyland Paris. The four Italians from Rome stole plush toys and various accessories on Monday afternoon from the World of Disney store in the heart of the Disney Village. The men were arrested by Police at 4 PM. The men aged between 31 and 42 years old were brought to trial on Wednesday at the correctional court in Meaux and plead guilty. They were all sentenced to three months in prison – suspended, and they missed their plane back to Italy. Le Parisien is reporting that four young teenagers tried to enter Parc Disneyland in the middle of the night. Disneyland Paris Security detected and prevented the intrusion which happened around 02:40 on 5 January 2018. The four young teenagers were surprised while climbing the security fence of the theme park. At the time of their arrest, they did not have identity papers in their possession. After being handed over to the Police, they were taken into custody at Chessy Police Station. 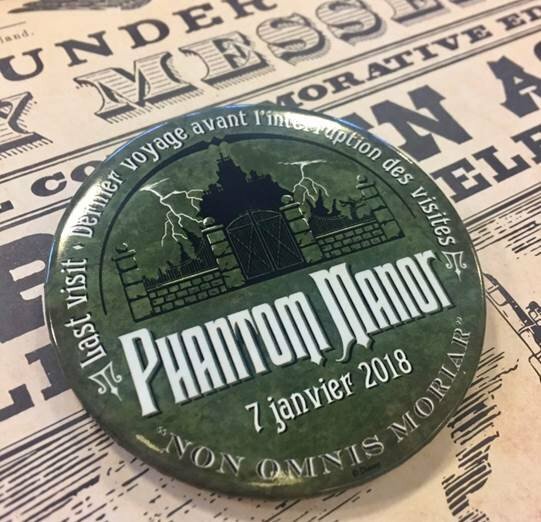 Sunday 7 January 2018 will be the last day of operation for Phantom Manor, at Disneyland Paris before its closure for refurbishment until October. To mark the occasion, you’ll be able to collect a collectible badge created just for you during this special day. To get it, you only need to give the password “NON OMNIS MORIAR” (Not Everything Dies) to the Cast Member greeting you in the Manor lobby. The badge is limited to one per person asking for it and numbers are limited, the attraction will be open until 9PM on Sunday. What it costs to be a Fan – Disney FanDaze Package Prices Released. Today Disneyland Paris announced the package prices for their Disney FanDaze Inaugural Party. Packages start from £364.20 and will be released for sale on 15 January 2018 and a limited number of standalone tickets will be sold in Spring 2018. Full details of the event and package prices can be found at fandaze.disneylandparis.co.uk. • Disney FanDaze Lanyard and Pin. *prices may vary depending on arrival dates and on the length of your stay and choice of Disney Hotel, based on 2 adults. Price per adult based on 2 adults sharing the same standard room at Disney’s Hotel Santa Fe for 1 night/2days parks in High season incl hotel accommodation and Disney Parks tickets and Disney FanDaze content depending on chosen package. Breakfast not included except if you stay in a Disney Hotel Club room or a Suite. The prices indicated do not include local taxes. An amount per person (from 18 years old and above, based on age at check-in) and per night of €0.99 will be added to the final price at the time of booking. Tax amounts subject to change. Fees per booking may apply, consult us. The offer is available in at least one Disney hotel per arrival date until options run out. With a themed package, you get everything from the Classic Package plus an exclusive extra depending on the theme you choose. Only a limited number of themed packages are available. You can book one from 15th January 2018 by calling 08448 008 898 (Calls cost 5p per minute plus your phone company’s access charge). The perfect package for the biggest fans of Disney Characters. Enjoy everything included in the classic package (starting from two nights in a Disney Hotel) plus premium extras. Starting from £646.20** per person (handling fees (£26 per booking) and local taxes not included). 16 Exclusive Character Madness packages available. The perfect package for the biggest fans of the Disney Parks. Enjoy everything included in the classic package (starting from one night in a Disney Hotel) plus premium extras. VIP FASTPASS for our most popular attractions. 100 Premium Park Enthusiast packages available. Two-hour tour of the Disney Parks with an Imagineer. Exclusive access to the VIP viewing area for Disney Illuminations and Disney Stars on Parade. • VIP FASTPASS for our most popular attractions. The perfect package for fans of Disneylicious dining. Sunday brunch with eight Disney VIP Characters in exclusive outfits. Exclusive Disney FanDaze Gourmand goodies. Workshop with a Disney chef. Ratatouille cookbook signed by one of our star chefs. 16 Premium Disneylicious Adventure packages available. The perfect package for our ultimate fans. Enjoy everything included in the classic package (starting from two nights in a Disney Hotel) plus FANtastic extras. Tickets go on sale 15th January. *** Ultimate FANtasia Guests need a valid Conference Add-on ticket to enjoy VIP seating. *prices may vary depending on arrival dates and the length of your stay and choice of Disney Hotel, based on 2 adults. Price per adult based on 2 adults sharing the same standard room at Disney’s Hotel Santa Fe for 2 nights/3 days parks in Moderate season incl. hotel accommodation and Disney Parks tickets and Disney FanDaze content depending on chosen package. Breakfast not included except if you stay in a Disney Hotel Club room or a Suite. The prices indicated do not include local taxes. An amount per person (from 18 years old and above, based on age at check-in) and per night of €0.99 will be added to the final price at the time of booking. Tax amounts subject to change. Fees per booking may apply, consult us. The offer is available in at least one Disney hotel per arrival date until options run out. **prices may vary depending on arrival dates and on the length of your stay and choice of Disney Hotel, based on 2 adults. Price per adult based on 2 adults sharing the same standard room at Disney’s Hotel Santa Fe for 2 nights/3 days parks in Moderate season incl. hotel accommodation and Disney Parks tickets and Disney FanDaze content depending on chosen package. Breakfast not included except if you stay in a Disney Hotel Club room or a Suite. The prices indicated do not include local taxes. An amount per person (from 18 years old and above, based on age at check-in) and per night of €0.99 will be added to the final price at the time of booking. Tax amounts subject to change. Fees per booking may apply, consult us. The offer is available in at least one Disney hotel per arrival date until options run out. If you’re a fan of Disney Imagineers and want to hear some of their best kept secrets, then these are the add-ons for you. Once you’ve booked your package, just add one of these amazing extras and you’ll enjoy an exclusive conference with Disney Imagineers in Animagique Theatre. ***To access conferences at Animagique Theatre, Guests need a valid Disney FanDaze Inaugural Party ticket. Duffy’s opinion is going to be controversial, but he does not believe that Disneyland Paris should be organising these Disney FanDaze character parties. The mentioned fifty Disney characters appearing at the event should be making Meet ‘n’ Greet, appearances in the parks on a daily basis for all Disney fans and resort guests to meet. Like they are at other Disney resorts around the world. Euro Disney are once again targeting their existing fan base and regular customers and not trying to attract the new returning guests that the resorts desperately requires to ensure a secure financial future for the resort. Duffy would rather Disneyland Paris invests in a new E-Ticket attraction in the Disneyland Park to attract more visitors to the resort. The construction of the rumoured TRON Lightcycle Power Run roller coaster would be a wonderful addition to Discoveryland in the Disneyland Park, which has not seen a new attraction built since 1995 when Space Mountain: De la Terre à la Lune opened. Could Duffy’s dream become a reality, well since the ride opened at Shanghai Disneyland in 2016, it has proved very popular with guests and a second TRON coaster is set to open at Walt Disney World’s Magic Kingdom in 2021. The package prices for the Fan Daze event are just too expensive for the average Disney fan to afford. The cost of this one night event is the equivalent to a four night trip, and with no concessions or discounts for Annual Pass holders this is going to cause a lot of controversy within the Disneyland Paris fan community. Hopefully when standalone tickets are released in the Spring they will be at a reasonable price, compatible to the Halloween Soirée and with an Annual Pass discount. But one thing is for certain with Marilyn Magness and Emmanuel Lenormand involved in the organisation of the Disney FanDaze event, the Inaugural Party being held during the weekend of 1 – 3 June 2018, at the Walt Disney Studios Park is sure to be an amazing event for all Disney character fans to enjoy – if they can afford to attend.